Named for its 17th- to early 20th-century owners, the Salvin Hours is one of the largest and most richly decorated English books of hours. Its decoration, created by two artists, resembles contemporary wall paintings in the Oxford area, suggesting that it was made in a workshop there. Its original owner probably was a high-status person living in Lincoln because it also resembles 13th-century books of hours associated with that city. It lacks a calendar, which would have helped to locate its original place of use because it would have listed saints' feasts special to a particular place. 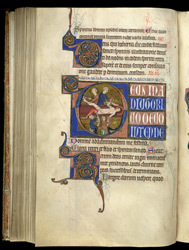 This page gives prayers for none (3 pm) in the Hours of the Holy Spirit, a set of meditations included in some English 13th-century manuscripts. In place of the scenes from the life of Christ that it gives the Hours of the Virgin, events from the lives of saints are depicted. The first letter of the prayers for sext presents the martyrdom of St Bartholomew, who was flayed (skinned) alive. He had converted the king of a pagan people and miraculously reduced the idol of the king's brother to fragments. The royal brother then ordered his death, depicted here quite undramatically. The knife-bearing executioners have pulled up chairs and go about their work matter-of-factly on the unmoved Bartholomew. The picture, which has nothing to do with the content of the prayer, is meant to give a model of Christian virtue.